On the return of the December 2016 trip to Scarborough the loco suffered a failure of one of its engines (B engine). The defective engine was removed from the loco and the failure investigated. It was found to be a fault related to the original manufacture, that resulted in a small weld fracture, which in turn caused a steel mesh becoming partially detached from the plate. This caused the ends of the big end bolts that were circulating above, to catch the mesh and flail it around the crank case and a small piece wedged between the side of the connecting rod and the adjacent liner skirt and punched out a small piece of the liner. This small piece, after a few attempts managed to make a hole in the crank case door. It was at this point that it was discovered by the travelling engineer, due to oil and smoke being everywhere within the engine room, however the engine was still running at full power with 90 PSI of oil pressure. The engine was immediately shutdown and the journey was completed on one engine. 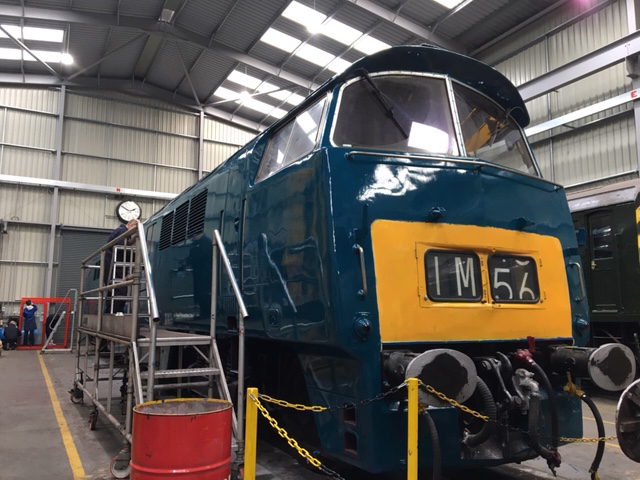 The other engine (A engine) has been running on the SVR ever since, however there is evidence that its condition has deteriorated due to a persistent drop of oil pressure and a recently discovered coolant leek between No 4 and 5 heads. This engine will now also be removed from the loco for inspection, however it would appear that its issues are probably down to wear and tear. Immediately after the Scarborough failure the DTG debated how to quickly replace the failed engine. It was suggested that a known engine repairers in Germany (that has carried out major repairs for the V200 among others) were approached to see what was possible. They were able to provide a slightly different speck short engine but it would still be compatible with our loco. Both sides quickly agreed that to produce a short block would be possible. A contract was signed and work commenced with a delivery date of approximately 6 months from the start of work (this was hoped to be June 2017). Unfortunately, due to circumstances beyond our control, including ill health by the German expert, this project has been significantly delayed. 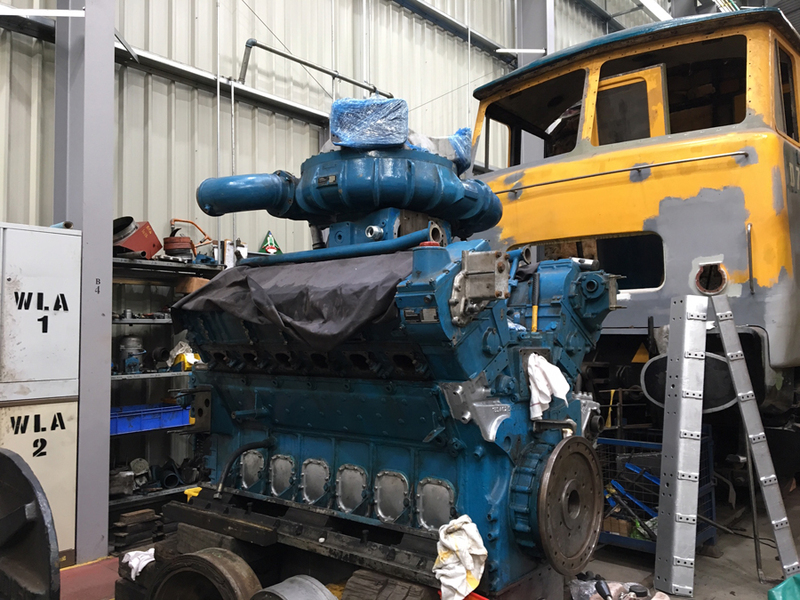 Over the last week we have received pictures of the completed short engine and expected delivery into Kidderminster is 26th November 2018. Owing to the protracted time scale that this engine has taken, the decision was made to alter our strategy. As both original engines in the loco were suffering problems, we are now currently engaged in building two replacements. The first is an ex BR crank case and the other being a recently purchased German built 538 which has been examined and found to be in excellent condition. 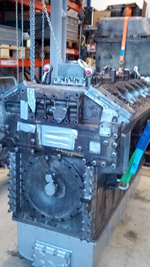 This engine was originally rated at approximately 800hp higher than required so it is being down rated, there are still a few modifications required to make it compatible with the loco and these are progressing well and no other major problems with compatibility with its British counterpart have been found. The Ex BR engine is a straight forward rebuild using all of the good parts that have been removed from the failed engine. Additionally, both engines are having their flywheels investigated to see if their rubbers can be replaced. We have been assisted in this project by members of the WLA, and we are close to having this work carried out. This will be a first in Maybach presentation. 1 Shortblock to be received from Germany. 1 Engine to be removed from the loco due to general wear and tear and further investigation. 1 Stripped engine (Scarborough Failure) to be assessed for further use / parts. 1015 is approaching completion of a repaint at Kidderminster in to Blue with half yellow ends. 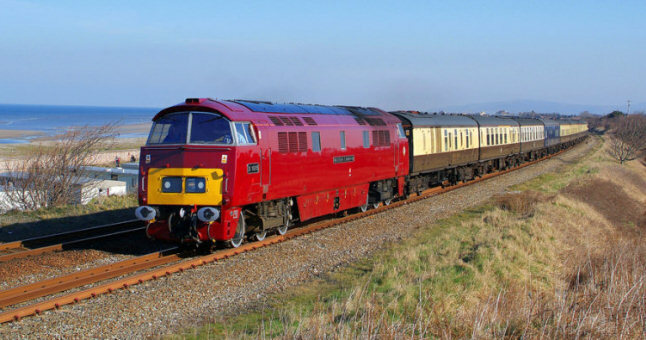 Western Champion gained mainline certification in 2002 and has since travelled all over the UK network, hauling railtours as far as Penzance in the South and Kyle of Lochalsh in the North. See the Railtour Archive for more details and photos of Western Champion around the country.